RGV FC president Bert Garcia, left, and RGV FC coach Gerson Echeverry pose for a photo on Friday at H-E-B Park in Edinburg. EDINBURG — The Houston Dynamo of the MLS will be playing an exhibition against the RGV FC Toros on Feb. 3 at H-E-B Park, and a CONCACAF Champions League round of 16 match may not be far behind. Beyond that, RGV FC president Bert Garcia said the venue is in discussions to host its highest-profile event to date, though he declined to disclose details given the sensitivity of the negotiations. Much closer to fruition is a matchup between Club Tijuana of Liga MX and F.C. Motuaga of Honduras’s Liga Nacional. The CONCACAF Champions League round of 16 contest would likely be held Feb. 21 or 22, Garcia said. Already official is a preseason matchup between RGV FC and the Houston Dynamo at 6 p.m. on Feb. 3. The Dynamo will be holding a preseason camp in the Valley from Jan. 29 to Feb. 4 in advance of the team’s season opener on March 3. 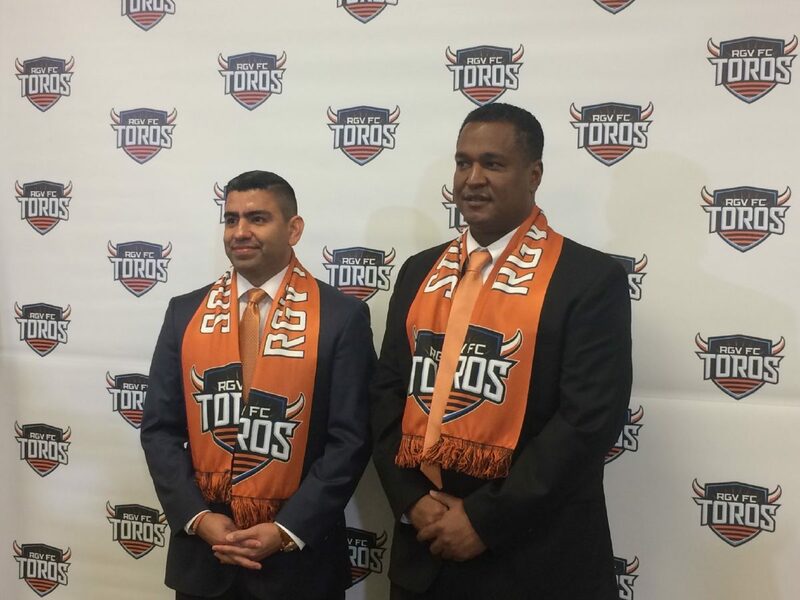 The Toros will be training with the Dynamo as part of the camp, building toward RGV FC’s opener March 16 against Saint Louis FC. The matchup will be the first of 17 home games the Toros play at H-E-B Park this season. The team’s full schedule was released on Friday. Tickets for the exhibition against the Dynamo go on sale Monday, with $5 for general admission and $10 for reserve seating.